New Year is definitely one of the most significant festivals for millions of Russians all around the world. If you happen to be in Russian on December 31, you can face some specific traditions that make the celebration of the New Year in Russia different from the same festival in other countries. Read out article if you would like to find out what you can expect to happen during this festival. if you would like to find out what you can expect to happen during this festival. For Russians the New Year is both a family festival and a party with their friends. As a rule, the first part of the festival starts at about 9pm and lasts until midnight. The whole family comes together for the New Year dinner. Tangerines, champagne and meat salad are the must-have dishes at the New Year dinner table. Until about midnight the guests usually have dinner, speak to each other, discuss the achievements of the last year and make plans for the coming year. At about 5 minutes to midnight Russians switch on the TV and watch the President of Russia addressing the people of Russia. This tradition started in 1976 and it has been followed since then. After that everybody celebrates the New Year while the Kremlin clock chimes midnight. People pour champagne in their glasses and say ”Happy New Year” to each other (we have talked about the ways of saying “Happy New Year” in one of our previous articles). At about 1am there is usually a firework at the city’s main square. The New Year firework is an essential part of the festival, and it is usually organized in a big way. For example, the Moscow municipality spends about few million rubles on the New Year firework every year. A lot of people go out to watch the firework – you won’t see so many people out on any other day of the year. The real festival begins after the firework! At this moment the family festival turns into the party with friends. Lots of people go to their friends’ where there is a huge table full with food and drinks awaiting for them; others go to night clubs and bars that traditionally hold New Year parties. Anyway, the celebration goes on until the morning. We cannot imagine the Russian New Year without father Frost and presents. In our article “How to say Merry Christmas and a Happy New Year in Russian” we mentioned that in Russia we give presents not for Christmas but for the New Year. If in the USA Santa Claus brings present, in Russia it is Father Frost with his granddaughter Snegurochka. Unlike Santa, Farther Frost wears a long blue coat, carries a long staff and travels in a carriage pulled by three horses. Presents are usually put under the New Year tree where children later find them. Adults don’t need to follow this tradition – you can give presents personally when you come at people’s place. New Year is one of the most popular festivals in our city. A few days before the New Year there are a lot of cultural and sports events, children’s festivals organized in the city. On December 31 this year you can see the New Year firework as well as the New year concert. And there will definitely be a lot of people in the streets and the festival will last until the early hours. Until the beginning of the 18th century the New Year in Russian was celebrated on September 1; this was the date of the beginning of the New Year in accordance with the Church calendar. In 1700 Peter the Great changed the date of the New Year to January 1 like in most European countries. Russians respect their traditions, but they are eager to adopt the new ones. The Chinese astrology, which is widely spread nowadays, has become one of the foreign traditions adopted in Russia. Almost any person can tell you the year according to the Chinese calendar (for example, 2017 is the year of the Rooster). Souvenirs with the symbol ate very popular presents for New Year. 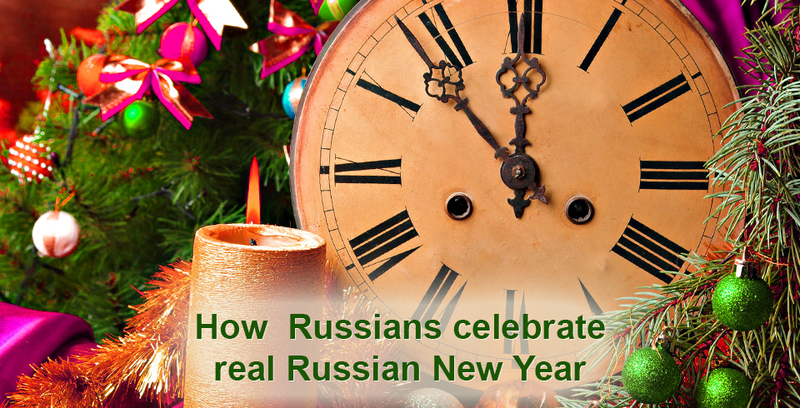 We hope you’ll find the article useful and now you know some interesting facts about the Russian New Year. But if you would like really understand what New year means to Russians, you should come and celebrate it together with Russians! If you have any questions about the New Year festival, you are welcome to ask them in the comments.